Several large earthquakes struck south of the Japanese island of Honshu on Sept. 5 and the two days following. 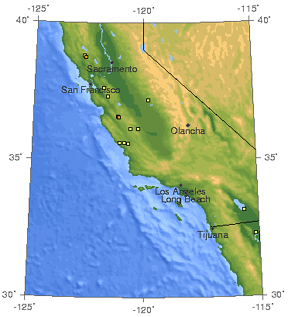 Researchers had predicted that a large earthquake would have hit southern California that day, but the only earthquake of note was a magnitude-2.5 temblor at the south end of the Salton Sea in the San Andreas Fault zone. The maps here show all earthquakes in the two regions in the past seven days, as of the afternoon of Sept. 7. Images courtesy of the U.S. Geological Survey Earthquake Hazards Program. Several large earthquakes struck Japan's central island of Honshu this weekend. Had these events occurred on the other side of the Pacific "Ring of Fire," they would have fulfilled a forecast by a team of seismologists that a large temblor would strike before Sept. 5 in Southern California. Vladimir Keilis-Borok and his co-workers have been developing models for the past 30 years that they hope could predict earthquakes with some assurance (see Geotimes, March 2004). Using databases covering several decades that catalog a variety of factors, including timing and magnitude among others, the team's algorithms cover California, Sumatra and elsewhere. As part of their testing, the modelers have published forecasts in the literature. 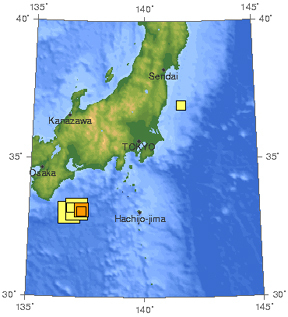 Two successes that the team claims are the San Simeon earthquake in Paso Robles, Calif., last December and a magnitude-8.1 earthquake that struck Hokkaido, Japan, last year on Sept. 25 (the Japanese government also claimed success in forecasting that earthquake). Keilis-Borok and colleagues' September deduction is only one of many that has had a null result. Nevertheless, Keilis-Borok remains optimistic. "Any earthquake prediction algorithm must perform when applied to earthquakes. Our team always expected from the start that some of our predictions would be false alarms; we are also confident that many will be correct," he said in a statement released by the University of California at Los Angeles, where the international team conducts its work. The most recent Japan earthquakes  a magnitude 7.0 at almost 20-kilometers depth followed by two of magnitude 7.1 and 6.3, according to the U.S. Geological Survey's Earthquake Hazards Program Web site  injured more than 40 people, according to Reuters. The first two earthquakes also triggered local tsunamis, half a meter to a meter tall. The Japanese government had its own forecast standing for a major earthquake to strike central Japan, of magnitude 8, offshore of Honshu but farther to the northeast. The epicenters of this weekend's major earthquakes were over 100 kilometers offshore to the south of the island. According to CNN.com, residents of Owase took shelter from more possible tsunamis from predicted aftershocks that might occur in the next week. No deaths were reported. In the meantime, Keilis-Borok and his co-workers will use this latest result to further improve their models. "We will learn from our mistakes how to improve the prediction methodology. That is what scientific experiments are for," he said. "If we made no mistakes, it would mean the problem is easy; and it is not easy, to put it mildly."